This review also appear in one of my other blogs, www.dancescriber.blogspot.com, at this link. 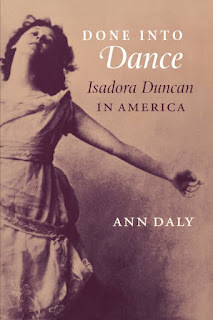 Ann Daly, Done into Dance – Isadora Duncan in America  (Middletown: Wesleyan University Press, 2002). This is a masterpiece of cultural history. Ann Daly manages to bring to life an iconic figure such as Isadora Duncan in a fresh and stylish way, going beyond the romantic stereotypes surrounding her legend and tracing an exceptionally well-researched portrait. This is not a biographical work, but rather a monograph that looks at Duncan’s life and work from “a massive void” in what we could call the Duncan Studies, that is her body. As is known, in fact, there is basically no video available of her performances and most of the photographs we have were taken in a studio and were, therefore, carefully constructed. Daly focuses on Duncan’s body from different angles. She dedicates a chapter to her dancing body which was the result of three interconnected “American movement traditions: social dance, physical culture, and ballet”. From the first tradition, Duncan gained the idea of dance “as a model of social, sexual, and moral behaviour”; from the second, the belief that dance could improve individual as well as collective body-and-mind conditions; from the third, she obtained material she could go against. Another chapter is dedicated to the dancer’s natural body, a pure and powerful construction. Duncan repeatedly talked of the Greek culture as a culture in close connection with nature and “narrativized the origin of her identification with ‘Nature’”. This was a kind of nostalgic and bucolic response to the rise of modernity. In this sense, a famous painting from the Italian Renaissance, Botticelli’s Primavera, is used by Daly to exemplify Duncan’s complex relationship with what she saw as Nature. Established a harmonious theory of the human system: first, life, the sensitive state of the vital realm, expressed through the limbs and excentric (outward) motion; second, soul, the moral state of the moral realm, expressed through the torso and balanced motion; third, mind, the intellectual state, expressed through the head and concentric (inward) motion. Delsarte’s theories were reshaped in the United States by his follower, Steele MacKaye and, more successfully, by MacKaye’s student, Genevieve Stebbins, whose work was quite influential among, besides Duncan, other modern dancers like Ruth St. Denis. Through Daly's analysis, Duncan emerges as still a fundamental figure in dance and cultural history, but with a more refined and detailed contour. Daly’s study is also filled with beautiful photographs and artworks inspired by Duncan's dancing image.